Ten-year yield forecasts are off by the most since September. Guggenheim’s Minerd sees rising odds of 10-year yields at 1.5%. It’s never been easy being a bond-market prognosticator. But while history is strewn with botched calls and embarrassing revisions, 2017 is shaping up to be Not only is there the Federal Reserve to worry about, but also a new U.S. administration struggling to enact its pro-growth policies and geopolitical risks from elections across Europe to saber rattling in North Korea. Perhaps that’s why on Wall Street, consensus estimates for the direction of Treasuries are proving to be so off the mark. Moody, who called for the 10-year yield to end the quarter at 2.71 percent in March, dropped his forecast to 2.46 percent on April 13. Higher yields have been a core component of the reflation trade, which was pinned on expectations of faster growth and inflation, as well as tighter monetary policy by the Fed and other central banks. Ten-year yields more than doubled from their all-time low in July to 2.63 percent on March 14. Since then, yields have retreated, falling victim to some of the same trends that led to the pervasive idea that rates would stay lower for longer. They ended at 2.27 percent on Monday. That view is reflected in something called the term premium. As its name suggests, the metric should normally be positive and has been for almost all of the past 50 years. Yet it’s back in negative territory — an anomaly that first emerged as a result of the Fed’s quantitative easing — suggesting investors can’t see any risks on the horizon that would push yields higher. Mark Kiesel, Pimco’s chief investment officer of global credit, disagrees and says investors are underestimating the Fed’s intent to raise rates. “The market is wrong in terms of only pricing one hike this year and a little over one hike next year,” he said. “The Fed is going to do more than that.” Indeed, futures traders are pricing in just one more increase this year, likely in September. Scott Minerd says the low-yield camp will ultimately prevail. Minerd, who co-manages the $5.7 billion Guggenheim Total Return Bond Fund, said the odds have risen that yields will fall to 1.5 percent over the next several months. As of Feb. 28, the fund’s largest holding was the principal portion of a stripped Treasury bond due in 2044, among the most profitable to own as rates fall. the Fed to rush. Bond investors see little chance that U.S.
Marine Le Pen and centrist Emmanuel Macron will make the second round of the French elections, a positive for euro and French government bonds. 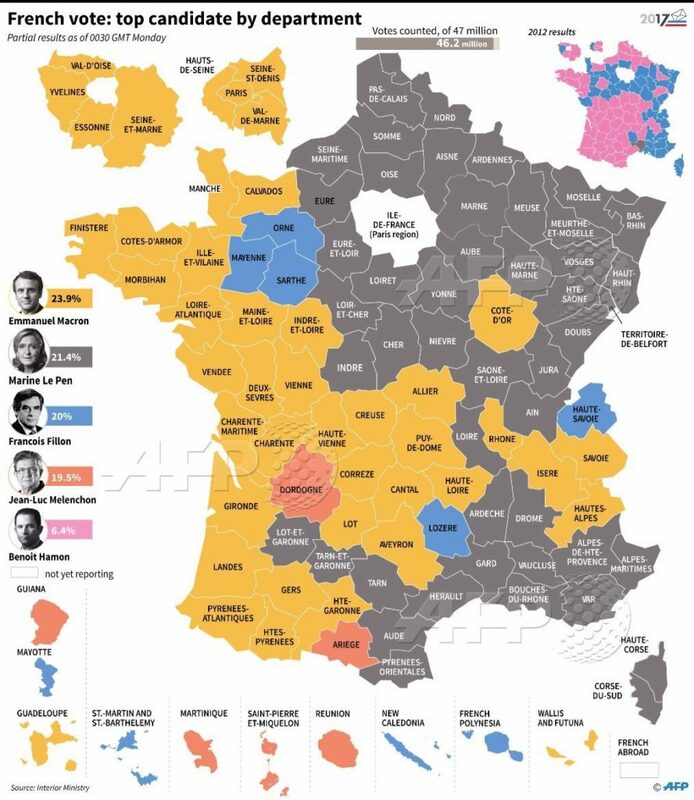 So far, populism’s rage has taken a rest in France, but it is much too uncertain to lay claim to final round winner. EUR/USD’s one month implied volatility plunged nearly 3.7 vol points to 9.4 vol, the steepest slide on a closing basis, going back to 1998. National Front leader Le Pen was on course to take 24.3 percent in Sunday’s election, with Macron, a first-time candidate and political independent, on 22.2 percent, according to projections from the Interior Ministry based on more than a third of votes counted, Bloomberg reported. Across the board, risk on assets are moving higher, risk off assets lower. 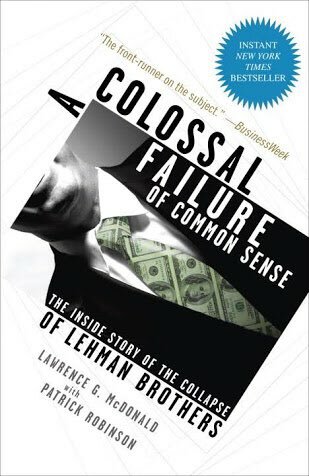 Lets not kid ourselves, when you combine failing fiscal policies with central banking steroids ($14T of asset purchases since 2008), you get an inequality explosion that results in populism. The euro surged against the dollar after the initial count of ballots in the first round of the French election showed that entrist Emmanuel Macron and the National Front’s Marine Le Pen were on a path to reach next month’s run-off. Euro moved to highest since November; trimmed gains as hedge funds fade the rally, now 1.8% higher to $1.0919. None of the candidates won an absolute majority, the two leading candidates will head for a run-off vote on May 7. Similar to Clinton – Trump in October 2016, nearly every poll has Macron beating Le Pen 60% to 40% in the final round. Not so fast, this is Le Pen’s best showing of her long political career. 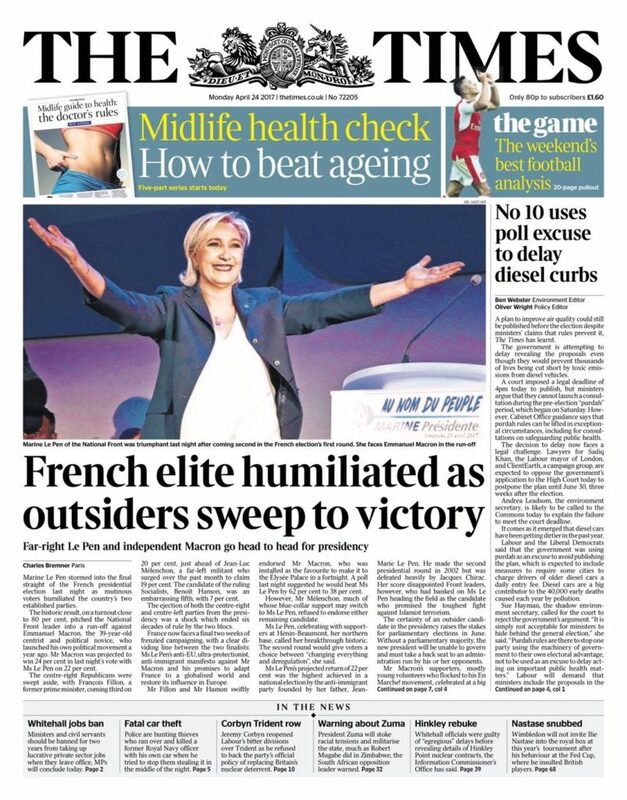 A far right candidate should not be doing this well in France, Le Pen’s strength speaks to an electorate shifting right in France. The Trump trade has some life left. We recommended clients short bonds last week in our Bear Traps Report, pick up our latest – click on the link below. Socialist Benoit Hamon conceded defeat as soon as the projected figures came through. He told his remaining supporters to rally behind Macron, in order to defeat Le Pen. Republican Francois Fillon also called on his supporters to back Macron in the run-off vote. U.S. 10 Year Treasuries surged to fresh 2017 highs after Friday’s soft economic data and testosterone filled rage coming at markets out of the North Korea. Bond futures players have grown more skeptical the Federal Reserve will raise interest rates aggressively this year. The Fed’s dot plot, central banker’s view on future hikes is up at two more for 2017. Implied rates on the fed fund futures curve are fully pricing in a September rate increase, with only a 20% percent chance of another by year-end. Bottom line, the spread between market participants and Fed governors views on future rate hikes has widened dramatically. Special thanks to Bloomberg’s Alexandra Harris (chart above). Overweight bonds, gold miners and emerging markets; we’ve done a solid job from clients in 2017. This week we’re focused the 50 percent retracement of the Trump Reflation Trade selloff at 2.178%. All those “bond bears” have been hit with some heavy punches in recent weeks, a short covering capitulation climax is near. 1. A Dovish Surprise Fed Meeting with no movement in the Dots. 2. Paul Ryan’s Fumble – ACA repeal vote failure in the House, Tax Reform curveballs from Washington. 3. FOMC’s Dudley Bloomberg interview on the Fed’s balance sheet. 4. Soft March Jobs data. 5. Mother of all Bombs in Afghanistan, U.S. Missile Strikes in Syria, North Korea-Trump testosterone filled Verbal Slugfest. 6. Friday’s Colossal CPI, Retail Sales miss. Friday, the Atlanta Fed revised their Q1 2017 GDP forecast down to 0.5%, dangerously close to recession levels. In just a few months the Atlanta Fed has moved from 3.4% to 0.5% economic growth outlook for Q1 2017. The Bottom line is wage data is NOT consistent with full employment. Average hourly earnings have risen at a very soft pace in recent months. Our Bear Traps Report wage tracker is treading water at 2.4% YoY over the past few quarters, that’s 0.60% below the rate is should be in a “full employment” economy. On Bond Yields, Why Has Wall St. Been the Gang that Can’t Shoot Straight? In our view, the current expansion’s full time job creation is 5 to 15 million short of what it should have accomplished. 1. The result is a large increase in underemployed, unemployed and idle individuals. 2. They number 129 million, 1.5 million less than the end of November 2016 and are over 50% of workforce. 3. In the eight years ended November 2016, their ranks increased over 10% by 12.53 million to 130.5 million. 4. The 129 million are unemployed, not in labor force and usually working part time. For the first time since February 2016, the cost of living in the U.S. declined in March. From 1986 to 2006, CPI inflation -month over month- results never printed below 0.0%, but since red prints have occurred seven times, the latest in March. The drop in the core rate was the – recession like – eye opener. A reading this low almost never occurs outside meaningful economic contractions. Leading the way south were apparel and vehicle prices. It’s clear, the colossal supply of unsold automobiles has created substantial price dislocations in the USA. March light vehicle sales equate to 16.62 million seasonally adjusted annualized rate of cars sold – the slowest pace in 25 months. In our view, the glut of unsold automobiles had a heavy hand in the biggest drop in core CPI in over 30 years this week. Friday, the U.S. dollar plunged to the lowest level in nearly six months versus the yen. After very weak inflation data, he greenback touched its the 200-day moving average first time since February 2016. In January, once again Wall St. sold their clients up the river on the “reflation trade” fantasy. In reality, today’s data shows core CPI (ex food and energy) fell for the first time since 2010. -The consumer-price index decreased 0.3 percent (forecast was unchanged) following a 0.1 percent advance the prior month. -From a year earlier, prices were up 2.4 percent (forecast was 2.6 percent) after a 2.7 percent gain. When we look at retail sector employment growth, the plunge has been spectacular. 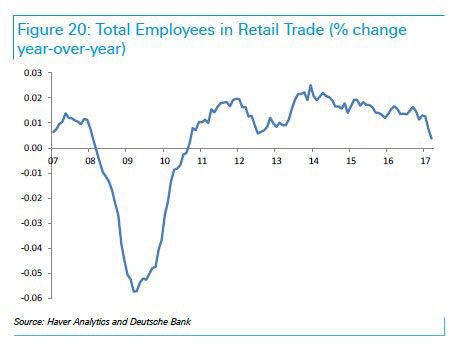 How much of this weakness is due to the structural shift of retail sales from brick and mortar stores toward less labor-intensive e-commerce firms, and what is the likely future pace of retail job growth? Pick up our latest report. Its been repeated one thousand times, the words are establishment group therapy in Europe, “Macron seen beating Le Pen in second round 62% vs 38%.” Have no fear, “populism will not come here” is the mantra, but credit markets are singing a very different tune. You now get 0.52% more on a two year bond in France than you do in Germany, the most in five years. The CAC 40 is up 27% from the June – Brexit lows, with the S&P 500 only 17% better. First-round support for French presidential election candidate Emmanuel Macron declined by 1 percentage point from yday to 22% while support for Jean-Luc Melenchon remained stable at 17%, according to daily Opinionway poll results published today. Safe haven assets advanced after the White House press secretary issued a warning to Syria and as tensions over North Korea surged to the highest level in over a year. Yes, Wall St. was all beared up on bonds for 2017. If we close at this level on 10s (U.S. 10 Year Treasury), it would be the best mark since November 15. For the fourth year in a row, the Street’s consensus has been dead wrong on bond prices. *Gold Miners GDX is up 3.1% today and 15.7% since March 9th. The Euro was lower against the Japanese Yen for 11 consecutive session, that’s the longest losing streak on record. The Yen is seen as a safe haven refuge in a rising Asia risk off environment. The Yen’s surge is viewed confirmation of the N. Korea high drama. In recent weeks we’ve witnessed a sharp divergence, the cost of default protection on S. Korea has surged relative to their neighbors in Asia. South Korea is a substantially stronger credit than Thailand, nearly five levels higher per Moody’s. On the other hand, the cost of insuring the South Korea’s bonds against default is now more expensive than Thailand’s, a powerful divergence indeed. Wall St lectured their clients on the “reflation trade” in December, they were unanimously calling for a STEEPER yield curve. If you look above, the curve is FLATTENING, not steepening. As investors grow more concerned about the growth initiatives coming out of Washington, they’ve been loading up on bonds. Key technical levels are being violated as the reflation trade loyalists panic out of their positions. U.S. bond yields fell following Federal Reserve Chair Yellen’s confirmation the central bank has shifted gears from post-crisis healing to sustaining economic gains. Oil wobbled after five days of gains as EIA data due Wednesday was expected to show U.S. stockpiles retreated from a record, Bloomberg reported. “I explained to the President of China that a trade deal with the U.S. will be far better for them if they solve the North Korean problem! Gold and Treasuries strengthened with the Japanese yen on lingering investor concern about global security risks and the path of U.S. interest rates. Crude struggled to extend this years. The cost of default protection on South Korea rose to the highest level since July on the surge in geopolitical nerves. S. Korea’s stock loans for short-selling hit record high amid the tensions. We heard so much about the upside-down home in the years since the financial crisis. From 2008-2013, many Americans found themselves in homes with negative equity, they owed more to the bank than they could sell their property for. Today, after eight years of an easy money gravy train from the Federal Reserve – too low interest rates for far too long – we’re seeing a surge in defaults in Auto Loans, Commercial Real Estate, Credit Card Receivables and Student Loans. Now translated into 12 different languages, our New York Times bestseller is a perfect gift for that college student. In Q4, over 32% of all “trade ins” toward the purchase of a new car were under water, an all time record. In Q4 of last year we witnessed a sharp deterioration in U.S. consumer credit quality. This by no means is on the same scale of the 2008-9 financial crisis, but we expect the current debacle to be drawn out and have implications for U.S. equities. Pick up our latest report on consumer credit, click on the link below. A Bank of America Merrill Lynch survey of 200 global fund managers showed just a net 8% say gold looks undervalued. The gold miners $GDX is up 26% from the December lows. In January, Wall St’s brain trusts lectured us, “underweight gold and emerging markets this year.” They argued with the Federal Reserve raising rates Gold and Emerging Market equities would under-perform in 2017. Wrong again Wall St.
*Consensus of Wall St’s economists recommended an underweight in 2017, pure comedy year after year. Weak dollar winners here: Emerging market debt ETF inflows continued for a 14th straight week, bringing the tally since late December to $7 billion, or 18% as a share of assets under management. A more cautious Federal Reserve and a soft job market have been a colossal tail wind for gold miners and emerging markets. – Biggest ADP – NFP spread in 5 years! Once again, the ADP jobs number (Wednesday) faked out Wall St. We witnessed the largest spread between the ADP and NFP result in years. – We’ve pounded the table on bonds since December, think Yellen’s (surprise) speech Monday will take us well toward 2.10% on the U.S. 10 year Treasury Bond. We believe there was a secular shift in consumer credit in Q4. Hardly anyone has noticed, but in the fourth quarter of 2016 there was a surge in financial stress across America, a shift in financial conditions that may have had a hand in the election outcome. The credit cycle is turning, right before our very eyes. In recent months, we’ve found a substantial amount of evidence in capital markets pointing to credit formation reaching a saturation point. If you look at high quality prime loans, there’s more evidence of a credit event in December 2016. Across the board in consumer credit we witnessed spikes in credit card charge offs, auto loans gone bad, sour commercial real estate, student loans and an uptick (above) in Prime Mortgage Delinquencies. We’ll be out with a consumer credit note later today. As we stated to clients in December, we’re bullish – not bearish on bonds. We believe we’ll get close to 2% before 3% this year. – Big miss in the NFP number, 98k, vs 180k expected, has led to a further bid in bonds, taking them below 2.3% Friday morning. Wage growth was in line, as we expected, the drop in the work week also helped this case in the February numbers. While the headline data points of this report do not look strong, some of the internals are not so bad. As we said in our report to clients, we would be surprised if today’s jobs date is enough for rates *the 10 year bond) to make a meaningful break of its trading range. Today’s ugly jobs data does not shift policy path at the Fed, considering the three month average is still +178k and wage growth is “decent” at 2.7% y/y. In December, Wall St. backed up the truck on the relation trade, they recommended clients buy financials, short bonds, underweight gold miners. Year after year they’re wrong again. They lectured us, “you need to be in infrastructure plays like copper.” Today, like scared rabbits they’re running for the hills. – Friday’s jobs number was pathetic for this stage of a mature economic recovery. The number came in 82k below Wall St’s forecasts – and job growth for earlier months was revised down by 38k. Based on industry data and household survey details, of course the Street blamed severe winter weather for the result. -Employment growth in private service-providing industries also slowed sharply to 61k (compared to +125k in February and +153k in January), with the deceleration led by education and health services (+16k vs. +66k in February) and leisure and hospitality (+9k vs. +27k). – While the headline NFP number was lousy, especially relative to the ADP number of 263k, some of the unemployment figures were positive. The unemployment rate fell 0.2 percentage points to 4.5% without us seeing a move in the labor force participation rate. This suggest the labor market is in fact tightening. It is also the lowest the lowest reading in U3 since May 2007 (4.4%). This was seen in the U6 number, measure of underemployment, had a big drop from 9.2% to 8.9%. Prime age employment to population figures also ticked up to 78.5%. These fundamentals are strong. This is a profound secular change in the retail shopping experience, no one has a clue where it’s going to stop. Retail jobs dropped 30k in the March reading and has now dropped almost 90k jobs since the recent high in October. The weather effects in the northeast were manifested in the weaker than expected construction job gains. At only +6k for March, construction jobs were much lower than the 59k number we saw in February. – A continued poor showing in the headline figures was in the revisions. The revisions for January and February were 38k less than previously reported, taking the three month average job gains total 178k. However, this a number the Fed is more than pleased with. Goldman doubled down on a June Rate Hike from the Fed, even with the soft jobs data. By raising their chances of a June hike to 70%, they’re trying to project confidence in light of an economy which still has many structural deficiencies.